Millions of Americans keep bedside books of prayer and meditative reflection—collections of daily passages to stimulate spiritual thought and advancement. The Intellectual Devotional is a secular version of the same—a collection of 365 short lessons that will inspire and invigorate the reader every day of the year. Each daily digest of wisdom is drawn from one of seven fields of knowledge: history, literature, philosophy, mathematics and science, religion, fine arts, and music. Impress your friends by explaining Plato's Cave Allegory, pepper your cocktail party conversation with opera terms, and unlock the mystery of how batteries work. Daily readings range from important passages in literature to basic principles of physics, from pivotal events in history to images of famous paintings with accompanying analysis. The book's goal is to refresh knowledge we've forgotten, make new discoveries, and exercise modes of thinking that are ordinarily neglected once our school days are behind us. 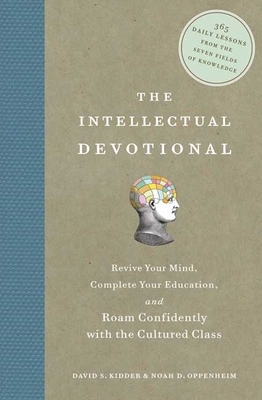 Offering an escape from the daily grind to contemplate higher things, The Intellectual Devotional is a great way to awaken in the morning or to revitalize one's mind before retiring in the evening. DAVID S. KIDDER is an entrepreneur with a wide range of technology and marketing experience. Kidder and his companies have appeared in articles in the New York Times, the Wall Street Journal, USA Today, and other publications. He lives in Westchester, New York, with his wife Johanna, their new baby, Jack, and Bella, their charismatic dog. NOAH D. OPPENHEIM, a producer of NBC's Today show, has extensive experience in television and print journalism. He has produced and reported for Scarborough Country and Hardball with Chris Matthews, and his writing has appeared in Esquire, the Wall Street Journal, Men's Health, and the Weekly Standard. He lives in New York City with his wife Allison.